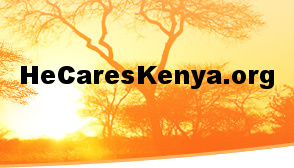 Welcome to ANAJALI MINISTRIES, INC. — the official website of the Anajali School, which brings hope to the children in the Kibera Slum of Kenya. ANAJALI means HE CARES (or in this case, GOD CARES) in Swahili. Anajali Ministries is a 501(c)3 charitable organization. All contributions are fully tax deductible. 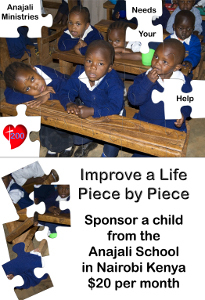 Anajali Ministries supports the Anajali Primary School through sponsorships. Sponsoring a primary student (for only 20 dollars per month) is the best way to assure that the school is still able to provide a quality education, as well as feed the students at lunch time. The cost of food continues to rise, making it more and more difficult to continue providing lunches, and teacher compensation is currently inadequate upon which to raise a family. We would like to increase teacher allowances and provide breakfast for the students, but we need your help. If you are interested in becoming a sponsor, you can do by clicking here. After a student graduates from the 8th grade, the next step would be to attend High School. Unfortunately, the families of these students cannot afford the $1000 per year it costs to attend one of Kenya's boarding High Schools. If you feel called to help a student continue their education so they can escape the Kibera Slum, please click here to see the students that need your assistance.